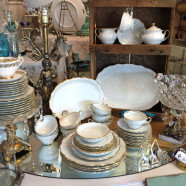 Ivy’s Porch is a charming collective shop in the Scotts Valley area of the Santa Cruz Mountains just 10 minutes from the Pacific Ocean and a convenient few blocks off Hwy. 17 using the Scotts Valley Drive exit. We occupy a 90-year-old home, shed and patios on an acre of meandering garden paths, surrounded by beautiful trees with a heritage redwood providing shade over the courtyard. You’ll feel a sense of welcome before you even walk through the front door. Over 16 dealers offer different styles of hand-picked items displayed in a home-like setting. Come browse through our rooms and indulge in a world of nostalgia and beauty. We offer a blend of antiques, vintage and collectibles, home decor and accessories, garden embellishments and locally made gifts. You’ll want to visit often so you don’t miss our one of a kind re-purposed surprises, hand painted furniture and unusual treasures.